Scientists are concerned about the steady decline in the number of Tufted Puffins along the Oregon Coast. While they used to number in the thousands, they have dwindled into the hundreds. CANNON BEACH - On a May morning, the tide flowing out, the sun shining, a man peers through binoculars at Haystack Rock, oblivious to the dogs, kids and beachcombers passing around him. Then suddenly, he shouts to a companion: "Hey, I saw one flying off the cliff. You could really see the color on its head in the sun. Way cool." It's the sort of shout heard frequently during the spring and summer months on this stretch of the Oregon Coast as visitors come from all over for a chance to glimpse the scores of Tufted Puffins nesting on the iconic North Coast rock. Haystack is considered the best place on the entire west coast to see the birds, and perhaps the only place where visitors have a good shot at spotting them with the bare eye, said Roy Lowe, U.S. Fish and Wildlife project leader for Oregon Coast Refuge Complex. 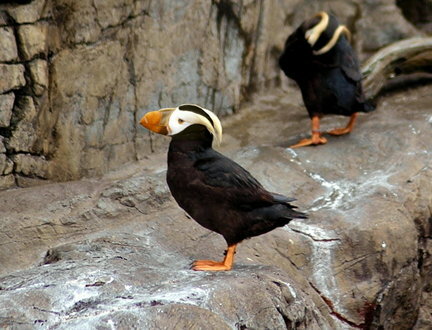 Black bodied with orange and yellow bills and yellow tufts above their eyes, the birds have become something of a mascot of Oregon's toniest coastal town, which is dotted with Puffin sculptures, jewelry and artwork. There's even a bottle of wine bearing their likeness. "They are unbearably cute and really tough little guys," said Tom Oxwang, a longtime volunteer with the Friends of Haystack Rock. But now, as numbers decline dramatically along the Oregon Coast, some are wondering if seabirds are tough enough -- or if they might vanish altogether from the state. "I remember the days when we would motor along the coast and we would see them quite frequently at many locations," said Lowe. "Now they are few and far between. We don't know what the cause is, so we don't know what can be done." Tufted Puffins are a cold-water species that spend much of their lives at sea – except for a few months in the spring and summer when the birds come ashore to mate and nest. They generally begin showing up at Haystack in March and over the coming weeks build nests in burrows in the sod for the single egg both adults will take turns hatching. "They come and go during the day to feed their young," said Lowe. "You can see them flying over head, carrying one large fish or 10 small fish. It's pretty fascinating that they can catch one fish and then catch another and another and another fish while holding onto the others." Meanwhile, the Friends of Haystack Rock will continue showing off their colorful feathered friends to the folks who come from near and far just to see them. This wooden sculpture of a Tufted Puffins helps guard the Surfsand Resort in Cannon Beach.